Perched precariously on the back (stern) of George Riou’s boat, I am 100% focused on capturing whatever drama is about to unfold in front of me. A shiver runs up my spine as a distinct change occurs in the sound of the giant twin motors that I am almost straddling. From their rhythmic pulse to a more high-pitched (alarming) whir. Not that this indicated any malfunction, rather that the props had left the water at the same time, an uneasy sense engulfs me. I appreciate exactly the reason responsible for this change of sound. We are teetering on the top of a giant 20 foot bowl as one of the most powerful swells ever documented explodes directly below me onto Tahiti’s infamous reef Teahupo'o. George has positioned his craft as close as humanly possible to the breaking monster in order for myself and the other photographers on board to get the best uninterrupted shot at these history making waves. I now have a view akin to a drone, looking almost directly down on the surfer, the boat has stopped any forward momentum as George, in show of extreme confidence or some sort of audacious captain’s maneuver, ever so subtly reversed. We now linger in this character building position. Good for getting an extra frame or two but definitely not for the faint hearted. This was boat driving par excellence. Wind back the clock: To fully comprehend this story I must recount from the start. My obsession and quest to document the best surf and waves on the planet takes me all over the globe. I constantly scan weather maps for potential (epic) swells and then pitch an idea to a client or conscientious editor who also share an unwavering interest in such events. In this particular period of time I saw a weather system on the long-term forecast that was to say the least exceptional. A system, that if it became a reality, would produce surf bigger and more powerful than I had ever seen for Tahiti. Ironically it was smack bang in the middle of a WSL (World Surf League, formerly ASP Association of Surfing Professionals) Billabong Pro Tahiti contest wait period. This would almost guarantee good-to-great surf either side of this peak swell for the contest. What was unusual was that this is the type of swell that would draw a whole different crew - being of the extreme big wave surfer persuasion, who live and nearly die for the rare perfect storms. I had booked my place on the boat to shoot the contest and would then just wait and see what evolved, as long-term forecasts frequently get down graded and may end up producing just another large swell. On arriving into Tahiti, the various weather models continued to predict a strengthening version of this swell forecast. Only a few people really appreciated the nature of this beast. Colleagues like Tim McKenna and myself were almost in disbelief at the scale and ferocity of this system. Between both of us we had witnessed nearly every major swell to hit French Polynesia in the last twenty years - this was off the charts! There was a strange ambivalence or possibly ignorance from those around the contest, as the forecast moved into the almost certain to happen category. Twenty-four hours before and all panic breaks loose amongst authorities. Confusion reigns supreme, watercraft will be banned except maybe a designated ASP craft - that would be the only one allowed out. Obviously this was not going to be acceptable so we decided to go rogue, organising with my usual captain Bjorn Drollet, father of Manoa Drollet (arguably Teahupoo’s finest big wave surfer ever) to take us out in his boat. First light and the biggest swell I've ever witnessed explodes on the outer reefs, pushing tidal surges where they have never been before. The normally calm lagoon is now a series of giant eddies and whirlpools. Boats are locked down in the marina and police are on hand with some-sort-of 'order' banning craft from leaving - it's a 'code rouge'. On the guise of going to get a coffee we head off, once out of sight we do a double back and head straight for the reef. No one is out yet as these giant foreboding lumps of ocean have begun heaving over the reef, it's almost impossible to determine a size as no one is surfing. It was eerie to say the least. At this time there was only one other boat and a few jet skies out there with us. 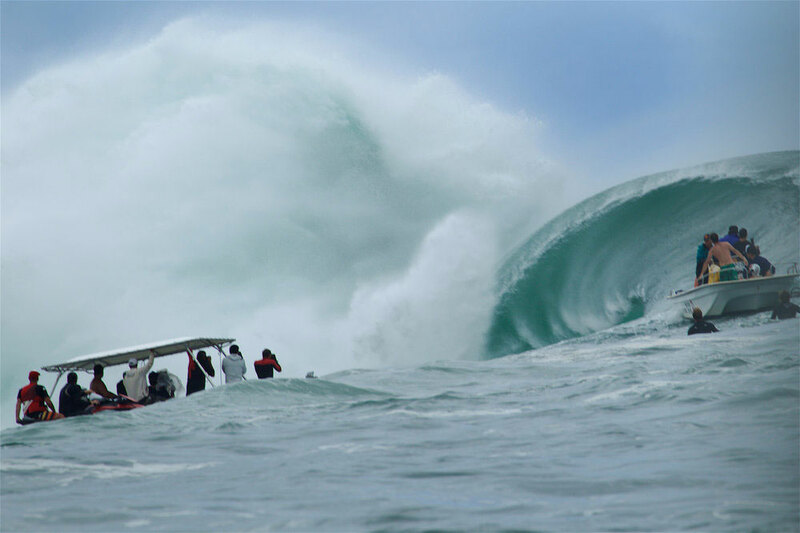 I noticed extreme big wave surfer Ryan Hipwood scoping possibilities from a ski, along with Brazilian charger Felipe “Gordo” Cesarano and Red Bull team Maya Gabeira and Carlos Burle. Not much time had elapsed before Hippo catches the first wave, not a big set but in the 12 foot range. Gordo goes next, slightly bigger and gets flogged. These are not even the sets we are waiting for, as on these types of swells sets will be at least half an hour apart. I am nervous (I don't normally get nervous) and aware we are in a whole new realm of surfing and surf photography experience. There was a real and present danger that someone could very easily die today. The line up gradually increases in numbers as a few boats and a few teams of tow surfers arrive. 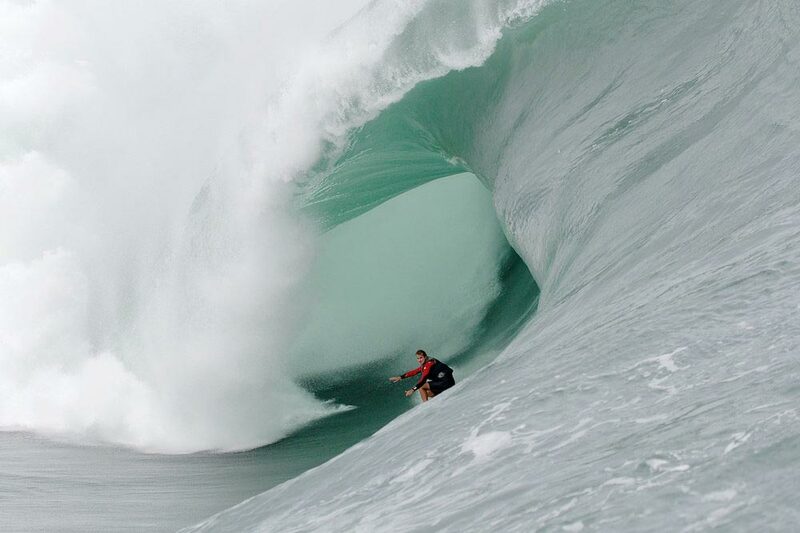 This type and size of surf is only possible by towing and is the rightful domain of a select few. There is an eerie vibe engulfing everyone that has ventured beyond the reef. A few more waves get ridden, surfers are getting flogged. Thankfully, with the advent of flotation devices and amazing back up by the ski partners the momentum picks up. Then some sets arrive, bigger, thicker, and nastier as time progresses. This is now officially serious. One of Teahupo'os most respected big wave surfers Raimana Van Bastolaer catches a set and dissappears, he gets caught inside and as the story goes was left standing on almost dry reef when the next wave of white water pummelled him into the lagoon, ripping off his safety vest, shedding his wetsuit and lacerating his body, and that was considered getting off lightly. Raimana returns to the line up to declare the surf closed and deemed unsafe. Nearly an hour or so elapses and numbers have started to increase in the line up but no one is surfing, such is the respect held for Raimana. Then, late arrivals Laurie Towner and Dylan Longbottom whom had been caught up preparing their ski were unaware of the 'no surf' policy and only saw an empty line-up. Laurie, an absolute respected master of Teahupo'o gets a bomb and it’s on again. Meanwhile our little boat develops a mechanical fault and we change boats onto George Riou’s huge aluminum vessel. Fellow photographer and good friend Peter Wilson and I are eternally grateful to George and indebted for life. Let me explain: George is one of the most experienced captains along with half a dozen of the skippers who know the reef intimately and are on hand to document every big swell. They are very competitive at positioning their craft so as to enable the best shot for their photographer passengers, while priding themselves on their abilities in the most hair-raising situations. Cool calm and collected: The situation for shooting surf at Teahupo'o is unique, a small almost V shaped very deep channel called a keyhole, abuts the reef. 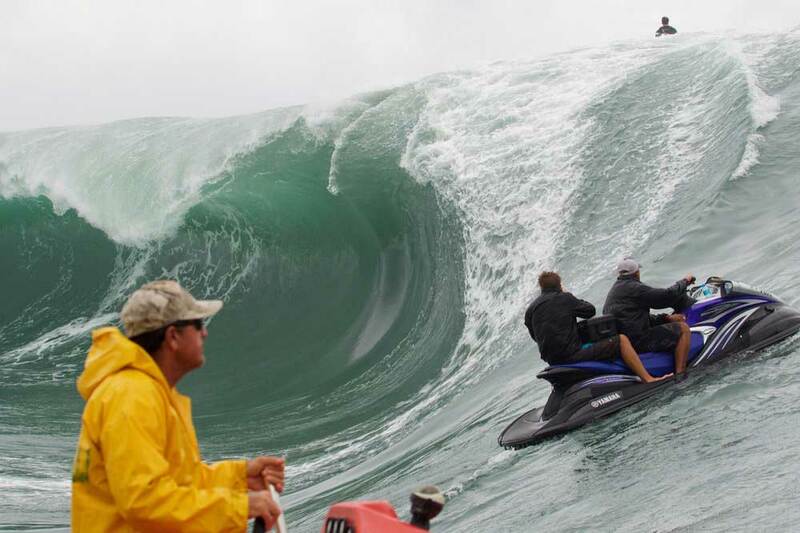 This makes it possible for the boats to sit in extremely close proximity to the wave and get up close and personal - this is where the water photographers would normally position themselves. But, there’s always a but! When a large set comes you have to move out to deeper water. With 2 or 3 boats it is possible to do this in a coordinated fashion. Now here is the but, now not only boats, but also every type of flotation device know to mankind is gravitating towards this little keyhole. Surfboards, body boards, kayaks, tinnies plus twenty larger vessels. This was a disaster waiting to happen. Only a handful of people really know the reef and the keyhole and their craft well enough to be where they were. The rest were following the leader, not unlike lemmings off the cliff. Now the dilemma, as I see it, was for George to hold this ridiculously close position long enough for us to get 'the shot' and then to navigate through literally hundreds of obstacles to escape the thirty foot set that was about to hit the reef. George is one cool cat: I see a set looming, this is a big mother, and I mean a very big mother! Thumps on the roof from Mick Fanning, who is perched with a prime vantage point, confers my sense of immanent danger. I try to be casual as I alert George, who is at this very moment on the phone to his son Alain in Namibia. George is excited, for what I consider the wrong reasons. With great delight he announces Alain has just had the longest tube of his life. The thumps, by this stage, have developed into a continuous pounding on the roof and are now accompanied by loud voices - I subtly remind George of the impending 25 foot wave looming in front of us. Chaos engulfs the keyhole; motors rev, there's wild splashing, crashing, and screaming as 50 other punters go into panic mode as we are lingering in the death zone. The flotilla scrambles for the horizon. I look at my Pelican case and assess the viability of stowing my equipment away safely in time. Then I had some sort of an epiphany, I concluded that it didn't matter about having gear if I was dead. Then in a cool calm and unwaveringly collected voice George says “Just shoot”. Was I hearing things? Had George gone mad? This could be the end. The flotilla has made some ground towards safety and only 3 or 4 boats hold steady, these are the dudes! Nerves of steel. Sitting in this death zone I am now faced with many confronting fears and decide to get on with the reason I came here for - to capture the moment, document an event and live to tell the tale. I surrendered and place full faith in our skipper. Heart in throat, motor drives whir and then, all of a sudden the massive surge of horsepower kicks in. Our trusty captain has not only placed us in the prime position for the shot but also allowed (seconds) just enough time to navigate the gaps in between the punters before hitting the throttle. Some were not so lucky, one boat had collided with a smaller vessel and this saw the occupants thrown into the seething mass of confusion. They were fortunately just wide of the impact zone by this time and were picked up by surrounding boats. Meanwhile the greatest show on earth continued. Surfers continued to challenge themselves and the ocean. Young surfer Dean Bowen got a bomb and could not fit the smile on his face aboard any boat in the line up. Bruce Irons had his board shorts torn off after one of the biggest waves of the day. Maya wiped out and lost consciousness and was resuscitated on the back of a ski, she survived. The rescue teams where the real hero's of the day, guys like Veta (Poto) David and others who continually put their lives at risk to save lives. But then the one we had all been waiting for. 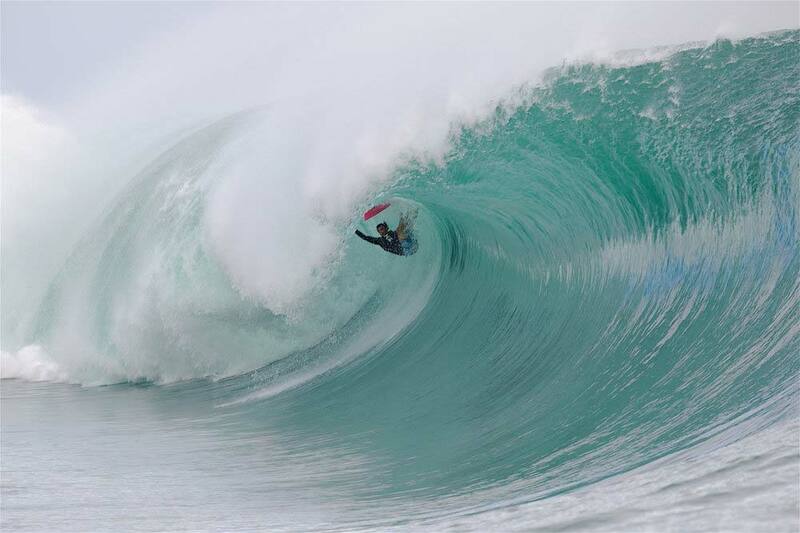 Nathan Fletcher drops into one that seems a little meatier than the others (understatement of the decade). This is big, he is deep, so deep, but it’s perfect. Nathan is picking the perfect line, he is doing everything right. He approaches the bowl section at one million miles an hour (at least) and the bowl starts to overtake him. A foam ball the size of a double-decker bus projectiles from inside the barrel. Nathan for a brief eternity surfs on the foam ball, this monster from the deep is about to swallow the surfer who just had one of the greatest rides in surfing history. Captain George (middle), Tim McKenna (left) and Shagga celebrating our life.